Stage 12 is completely flat, taking in just two roads: the SS. 16 “Adriatica” and then the SS. 9 Via Emilia. Once the peloton has passed through the finish line of the Tre Monti circuit, they’ll do another lap before finishing on the Imola Formula 1 racetrack, where Ilnur Zakarin won in 2015 and Vittorio Adorni became world champion in 1968. Expect a sprint finish this time around. Sam Bennett (Bora-Hansgrohe) won a frenetic stage 12 with a powerful sprint from a long way out on the famous Imola Racetrack. The Irish rider was able to hold off a late-charging Danny van Poppel (Team LottoNL-Jumbo) and Niccolo Bonifazio (Bahrain-Merida) for his second stage win. The general classification was unchanged as Simon Yates (Mitchelton-Scott) holds onto the race lead. Bennett was forced to open his sprint incredibly early due to the presence of Matej Mohoric (Bahrain-Merida) and Carlos Betancur (Movistar) dangling off the front with 400 meters to go. “It was a tough finale. There were two guys in front, I didn’t know how much energy they had left, but I didn’t want another win to get away from me, so I decided to go early. I didn’t know if I could hold it or not, but I think I caught some guys by surprise, so it worked to my advantage. What was billed as a routine sprint staged ended up looking like a spring classic more than a 214-kilometer grand tour transition day. The race was complicated by pouring rain and brisk crosswinds that shattered the peloton inside the final 30 kilometers. Elia Viviani (Quick Step-Floors) was caught behind as the peloton split with GC contenders Domenico Pozzovivo (Bahrain Merida) and Richard Carapaz (Movistar). After a brief panic, the peloton came back together a few kilometers later, but the chase back on left the sprint jersey wearer vulnerable and Vivani was dropped again soon after. As the race approached the finish on the Enzo e Dino Ferrari racetrack in Imola, the peloton hit a 4.3km long climb with 10km remaining. After a series of unsuccessful attacks on the climb itself, Diego Ulissi rode clear over the top, with Betancur and Mohoric bridging on the wet, dangerous descent soon after. Mohoric carved through the wet corners with ease as the race snaked down towards the finish line and distanced a lagging Ulissi. With Betancur tucked into his slipstream, the two riders hit the 1km to go banner with a few seconds in hand while the chances for a sprint finish decreased rapidly. Sensing that an opportunity for a stage win was slipping away, Bennett launched his sprint incredibly early and caught the remaining sprinters off guard. He was able to open up a significant gap immediately and held it through the line for his second ever Giro stage win. 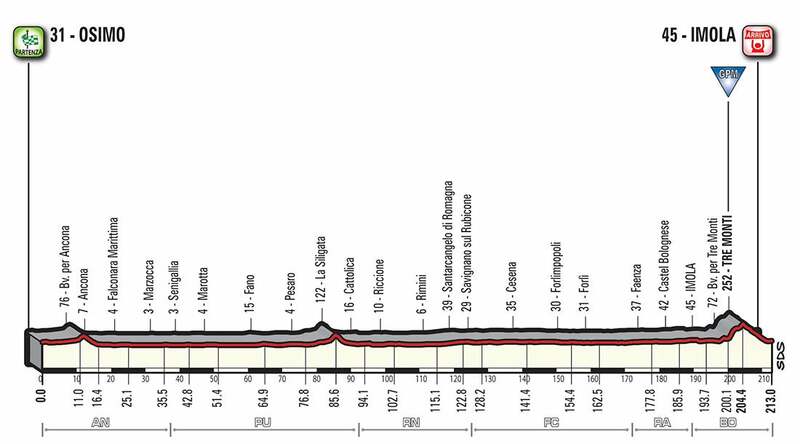 Tomorrow’s stage 13 is a 180-kilometer transition day from Ferrara to Nervesa della Battaglia. While this Giro is proving that anything can happen on any day, the peloton will likely be looking to take it easy in advance of Saturday’s brutal summit finish on Monte Zoncolan.